It's here! 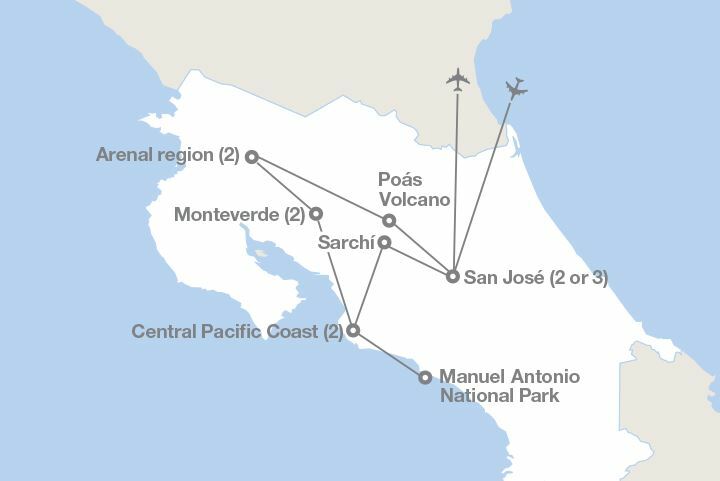 I have decided on our next trip for 2020 - we are headed on an adventurous tour to central america to explore Costa Rica! This is an action packed 10 day tour including activities such as ziplining, kayaking, white water rafting, hot springs, volcanoes, and more! Space on the trip will be limited and subject to approval by Ms. Crissman. Teacher Recommendations: You must submit 5 teacher recommendation forms. These should be given to your teachers and they should return them to me personally or put in my mailbox. Please give these out as soon as possible so your teachers have adequate time to complete them and return them. Online Application: Visit our tour website: www.eftours.com/2107581pk and fill out the online application. You must also pay a deposit of $95. This will be refunded only if you are not selected to participate. 1. Can adults/parents also chaperone the trip? YES! Anyone 20 or older at the time of travel is considered an “adult.” If you are graduating this year (or graduated last year) and still want to come, you are welcome. Anyone under 20 at the time of travel qualifies for the “student rate.” Anyone age 20 or older will pay the adult rate which is slightly higher but guarantees you 2/room instead of 3-4 like the students. We have had parents come on every trip with us and they have had as much fun as the students! 2. Do I have to be a Wi-Hi Student to go on this trip? No! However everyone must be approved by Ms. Crissman and complete the application process outlined above. Please note that this is not a Wicomico County BOE Sponsored trip. 3. 2020 is so far away, can I wait to sign up when it is closer? Yes, however the price will definitely increase the closer we get to departure. Remember you don’t have to have the money up front – you can do an interest free payment plan through EF or pay in chunks. Contact me for more information. Enrollment will end 110 days from our date of departure. 4. I don't speak another language - can I still go? Yes! We will have an English speaking tour guide with us for the entire trip. At no point will it be expected that travelers speak a different language. However, I encourage you all to learn a little bit about the languages so you can say courteous phrases - please, thank you, etc. 5. What will the alcohol/tobacco policy be for students on this trip? No one under the age of 21 will be permitted to consume alcoholic beverages, even if the student is of legal drinking age in the country we are visiting. Tobacco use by anyone under the age of 18 will not be permitted at any time. We will assume all US laws apply. Students who break this policy will have consequences which may be returning home from the trip early. 6. So, just anyone can go on the trip? No. All travelers must be approved by Ms. Crissman. If a traveler has any discipline issues leading up to the trip, they may not be permitted to attend. Since we will be in different countries where they speak different languages and have different laws, it is imperative that Ms. Crissman and all chaperones can trust the travelers 100%. This is for the safety of all of the travelers in our group. 7. Why don't you know our exact date of departure? To provide us the best "bang for our buck", EF will book our flights about 90-110 days from the date of departure. Several factors will go into the exact date of departure including availability of flights, hotels, and a tour guide. The date we have chosen - June 21st - gives us the window of June 17 - June 25th for our departure date. I will let travelers know the exact date the *second* EF confirms it with me! 8. How can I pay for this if I don't have all of the money right now? Option 1: Pay in full at enrollment - FREE! Option 2: Automatic Payment Plan - FREE!